As summer blooms begin to fade, it’s time to welcome the warmth and beauty of fall. With fall’s traditional flowers, you can brighten your space with centerpieces that bring the perfect autumn accent into your home. As the leaves change from green to yellow, orange, and red, fill your home with the colors of fall. Seasonal flowers with warm, vibrant colors such as orange, fuchsia, yellow, red, or even green create a beautiful, earthy arrangement. Mums, marigolds, hydrangeas, sunflowers, roses, tulips, and orchids are just some of the flowers that add unexpected pops of gorgeous color to your home. Consider containing your arrangement in something other than a vase. Getting creative with your flowers can really make your centerpiece pop. 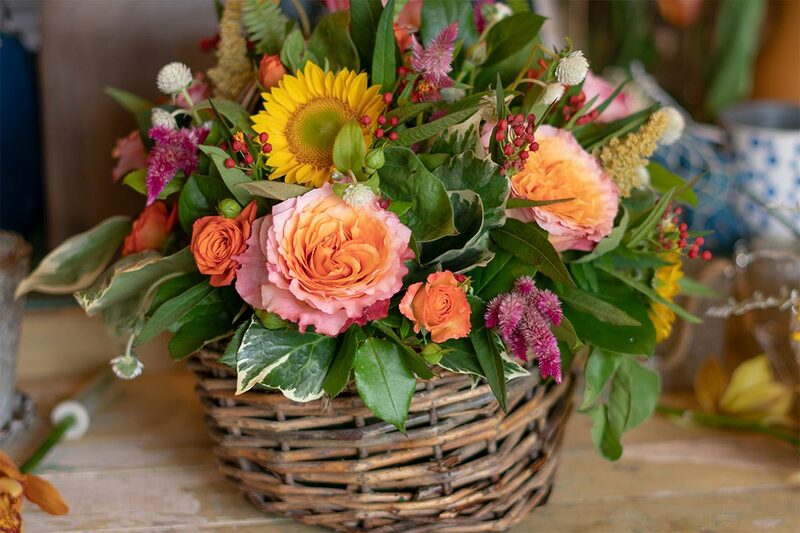 A rustic or worn basket can pull your arrangement together while allowing the flowers to remain center stage. Don’t limit your arrangement strictly to flowers! The earthy greens of ivy or succulent plants make for a beautiful transition into fall. For a mid-fall arrangement, adding small gourds and pumpkins will accent your flowers and bring the autumn season into your home. Here are some tips for making your beautiful fall arrangement last. Be sure to water it regularly. Don’t dump the water out of the arrangement, but run the water through the flowers until the water runs clear. Remember to remove the leaves that hang below the water line to avoid polluting the water. Dropping a penny in the water of an arrangement with tulips can revive them and make them stand up tall. Floral arrangements are a beautiful accent to every home. With these tips, you’ll be able to fill your home with the vibrant colors of fall and make them last longer, too.